Spring has mostly arrived in the Ozarks. The snakes are out including the speckled king snakes. People usually think of black rat snakes when they think about rat and mouse control. 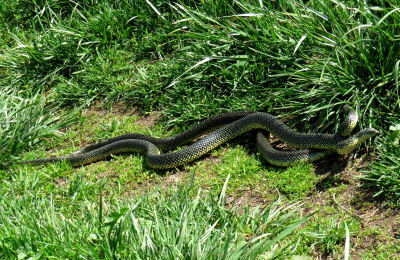 Many decide to leave these alone as they will eat other snakes such as copperheads. Speckled king snakes are similar to black rat snakes. Both eat rats and mice. Both are constrictors, squeezing their prey. Both live in similar places. Black rat snakes get bigger. These two speckled king snakes rolled over and over wrapped around each other. A pair last year did this for over an hour. In spring these snakes come out during the day. Speckled kings are shy and flee before being spotted much of the time. I see their tails disappearing into the grass. I’ve heard speckled kings don’t make good pets. I don’t think any snakes make good pets, but a cousin did. He had a black rat snake. It was used to being handled and was the first snake I ever touched. Snake scales are cool, dry and smooth to the touch. They seem waxed. Once summer weather arrives the snakes stay in cool places during the day. Evening and night are the times they come out looking for food. Except in my hen house. The black rat snakes stay under the wood floor of the barn. They have plenty of mice to snack on. Still, they find eggs irresistible. I’m slowly remodeling to discourage their visits. These two speckled king snakes had been entwined, possibly mating as this is the right time. Moments later the smaller male took off followed by the larger female. Speckled king snakes never seem to be in the barn. They do come through my garden. Most commonly they are out in the pastures. 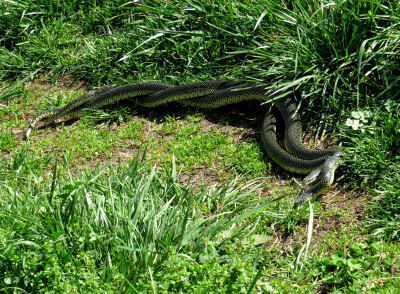 Regardless of where the snakes are found around the house or barn, they are rarely killed. A couple showed up in my pantry and were moved outside. Snakes are far too valuable as mouse and rat control to harm. The big problem with the snakes is that they maintain their body temperature by sunning so they don’t need a lot of food. They don’t eat enough mice. This entry was posted in Ozark Hills and tagged black rat snakes, controlling mice and rats with snakes, Ozark snakes on April 10, 2019 by [email protected].